Most Mercedes automatic transmission problems originate from a lack of inspections. Mercedes automatic transmission repairs can be significantly expensive, many european auto repair shops do not have the training or experience t0 properly diagnose problems when it rarely occurs. GCD Is a Factory authorized and trained ZF repair center. (Many MB have ZF transmissions) Every day we solve transmission and drivability issues. Most transmission problems are not terminal if caught early. The most common problems are lack of fluid ,sensors reading incorrect ,computer programing and firmware updates. At GCD we use the (kiss) method first. “Keep it simple stupid” The cost to repair is most often lower than most customers first think. Would you hire a first year law student? No you want the best representation with over 25 years of experience. German Car Depot is a smart choice for accurate cost effective service/repairs. Call Now. You may even qualify for free towing. 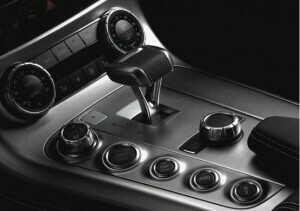 Many Modern Mercedes Benz Automatic Transmissions have as many as 9 speeds and use an adaptive shift learning gearbox. Older models were prone to gear train failure resulting in damaged internal components. The most noticeable symptoms of internal transmission failure are loss of movement in forward or reverse and/or whining, grinding or banging sounds when engaged in gear. The sounds can occur with or without vehicle movement. Gear train failures have been greatly reduced in later model transmissions due to a high tech computerised fail safe systems. Please read our case studies about how saved many customers from falsely condemning an Automatic transmission. 1. Burnt smelling transmission fluid (dark in color) and fine granular metallic particles in the bottom of the pan: This means that you need to change the filter and filter pan. The smell of burnt fluid indicates high levels of clutch wear and tear resulting in heat building up. Metallic dust in the bottom of the pan usually means excess gear or bearing wear. This does not mean that your transmission will fail today or even in a month. By keeping the fluid clean you will get more life out of the transmission. This can reduce some of the clutch slippage and friction thus reducing heat. Bring your Mercedes here to GCD, and we will detect the problem and put the correct additive in your vehicle which is essential for proper transmission functioning. This is a good indicator of mileage wear and tear on the transmission. When the car is at a stop, move the gear from park to reverse or drive. How long does it take to engage? You will feel a delay of a “clunk”. If it moves immediately that’s a good indicator that you have a strong transmission. If it takes more than 1 second you have a normal wear and tear level. If it takes longer than two seconds this is a sign that the transmission is wearing and it needs either service, repair or replacement. 3. Won’t shift into higher gears or slips – flairs when going into gear. This is a sign that the transmission needs to be inspected. However before you jump to any conclusions, bring your Mercedes Benz to GCD and we will do a full diagnostic evaluation and find out exactly what is wrong. It could need programing, Transmission fluid or a sensor or maybe . · Check/change transmission fluid level: The fluid in an Mercedes automatic transmission plays an important role. It cools the transmission, lubes internal transmission parts, and transfers hydraulic pressure to shift gears. Ensure that the fluid levels are checked regularly otherwise it can cause parts to deteriorate. GCD can help you check the level and change to the proper type of fluid, if necessary. · Be aware of leaks: Checking underneath your vehicle for leaks or puddles of fluid. Call GCD if you should spot any on the ground. · Properly tune your engine and drivetrain components inspected: Check that your engine is running properly to avoid transmission stress, and have all your drivetrain components including Transmission Mounts, engine mounts checked by our technicians. · Allow vehicle to warm up before driving. Wait a couple of seconds and give your transmission fluid some time to sufficiently warm up to operating temperature. · Rough Shifting: If you feel like the gears aren’t smooth while shifting and it simply refuses to shift properly, then you probably have a transmission problem. If this is the case, have your transmission fluid checked and an examination of the shift cables and clutch linkage. · Slippage: If you notice that you’re popping out of gears, a delay in acceleration or coasting, or feel a “slipping” sensation, then you probably have a transmission slip problem. This can be quite dangerous and you should take your Mercedes-Benz to German Car Depot pronto. · Overheating: Lubrication is lost at higher temperatures, so heavy towing and stop and go traffic in hot temps are major culprits for overheating. You may even smell burning transmission fluid if your Mercedes-Benz is overheating. Have the fluid level checked—and make sure it’s not leaking—and changed if needed. · Clunking & Whining Noises: On both an automatic or manual, Hearing these sounds indicates a problem. To be safe, it’s best to have German Car Depot replicate the problem and diagnose the problem. · Slippage: If you notice that , a delay in acceleration or coasting, or feel a “slipping” sensation, then you probably have a transmission slip problem. This can be quite dangerous and you should take your Mercedes- Benz to the shop pronto. · Overheating: Lubrication is lost at higher temperatures. heavy towing and stop and go traffic in hot temps are major culprits for overheating. You may even smell burning transmission fluid if your Mercedes-Benz is overheating. Have the fluid level checked—and make sure it’s not leaking—and changed if needed. · Clunking & Whining Noises: Whether you have an automatic or manual, hearing these sounds can be troublesome. To be safe, it’s best to have your German Car Depot the best independent Mercedes-Benz service shop try to replicate the sound and identify the best course of action for the problem. By paying attention to noises paying attention to how the car feels, drives and smells you can detect Mercedes automatic transmission problems and prevent further damage. German Car Depot will make your Mercedes Benz automatic transmission service/repair experience as pleasant as possible! GCD will do our best to keep your cost of transmission repair to a minimum.